"According to the information we have, in some routes, some of the cities, there are elements who are provoking some of the truckers, or possibly blocking them and creating problems for them. They are subject to the rules and regulations of banditry and the punishment of the bandits according to the law is very severe, sometimes resulting in the death penalty. "(News Network TV News – September 29). At the same time, Ali al-Qasimehr, the chief justice of the Fars province, accused the strikers of "corruption on earth," and IRGC Brigadier General Mohammad Sharafi, one of the commanders of State Security Forces, threatens the protesters with harsh action. (State TV - September 29). However, two days earlier, the Fars Province Transportation Director General had called the strike of truck drivers as rumors and said: "It's been a few days that rumors about truck drivers’ strike have been circulating in the media and cyberspace. This misuse of the opponents from the needs of the truck drivers to create crisis in the country is clear for every Iranian (FARS, Islamic Revolutionary Guard Corps news agency, September 27). IRGC Colonel Kavos Mohammadi, a deputy of the Fars provincial police force, described the strikers as "disrupters of the order," and said: "Following the disrupting acts of some of these people on the roads of Fars ... After the visible and invisible patrol of officers, 22 thugs and disrupters of public order on the roads were arrested and, after filing a case, they were sent to the judiciary authorities and through them to the prisons. Police will deal with sensitivity and vigilance with the smallest insecurity factors in coordination with the judiciary, and the process of confronting with the disrupters of order and security of the roads and axes of Fars province will continue on a daily basis. The police monitor and control all the roads in this province, visibly and invisibly, and resolutely deal with all elements of disrupters of order and security in these areas "(IRNA news agency - September 26). 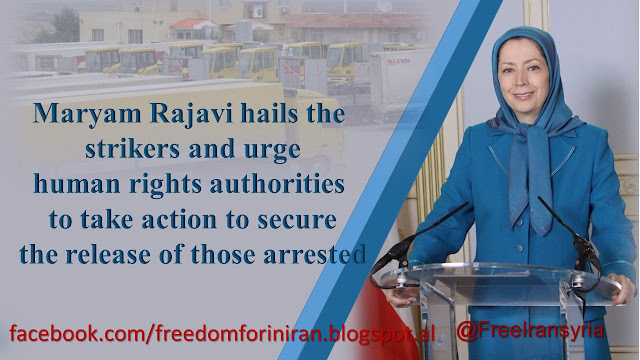 Mrs. Maryam Rajavi, President-elect of the Iranian Resistance, saluted the strikers throughout Iran, describing the vindictive threats of the clerics against the dignified and hardworking drivers as a reflection of the growing crisis of the clerical regime, and said that the ruling mullahs were the biggest bandits in the history of Iran, and that they neither want nor can respond to legitimate demands of striking drivers. She called on all human rights organizations to take action to release the arrested and urged the general public, especially the youth, to support the strikers. She added that realization of these demands is only possible with the establishment of democracy and people's sovereignty. A regime that threatens to execute its working people due to a strike must be rejected by the international community. 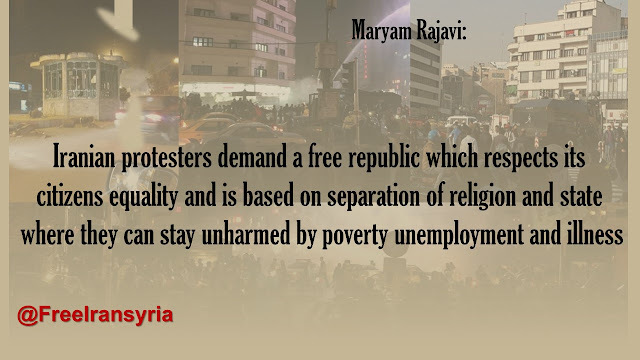 Maryam Rajavi, hailed today’s uprising by the people of Tehran, Isfahan, Shirza, Mashhad, Ahvaz, Karaj, Arak, Shahin-Shahr, Najafabad and other cities. Courageous people and youths, especially young girls, demonstrated on Wednesday evening, August 1, for the second straight day. Police and intelligence suppressive forces, riot guards, IRGC, Bassij and criminal plainclothes mercenaries were deployed to prevent uprising of the fed-up people. 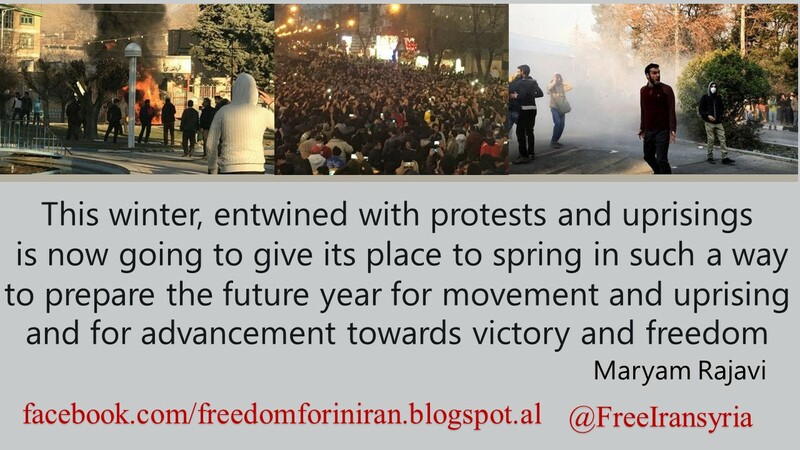 However, the fearless youth rallied from the first square of Gohardasht toward Motahari Street. The crowd, which was added every moment, chanted: “Cannon, tank, firecracker, the mullahs must get lost”; “Death to the Dictator”; “Our enemy is right here; they are lying that it is America!”; "Let go of Syria, think about us"; “Khamenei lives like gods, while the people live in poverty”. 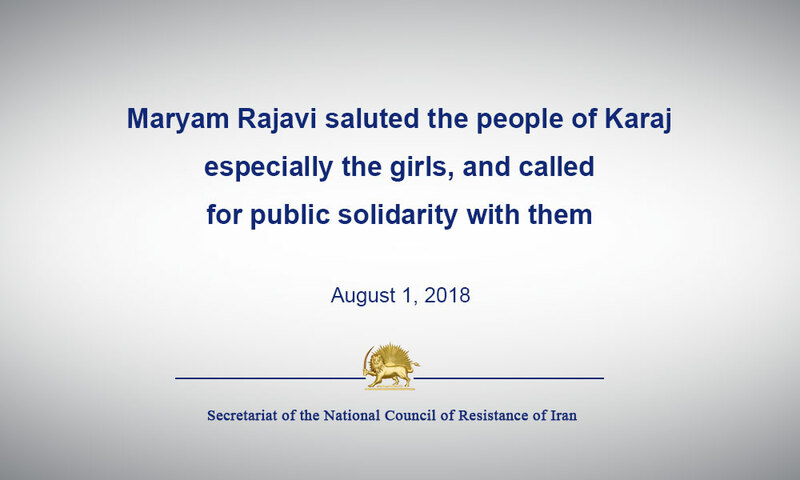 Maryam Rajavi, saluted the rising young people in Karaj, praising the courage of freedom-loving girls at the forefront of the protests against the suppressive and corrupt regime of the Velayat-e faqih. 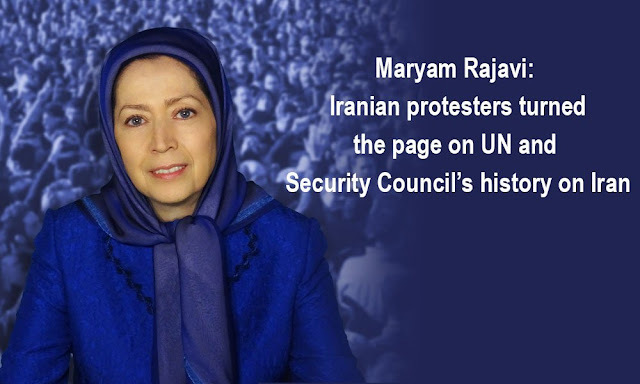 She described their presence and struggle as the pride of the Iranian people, especially the freedom-loving women. She called on all people, especially women and youth, to show solidarity with and support for the rising people in Karaj. I would like to extend my sincere congratulations on the International Workers Day to each and every one of you. This day harbingers a bright future where workers are no longer exploited, plundered or oppressed but enjoy freedom, justice, equality and fraternity. I would like to salute the workers who gave their lives for this lofty cause, those who embraced the pain of being imprisoned, losing their jobs and being deprived of their rights. 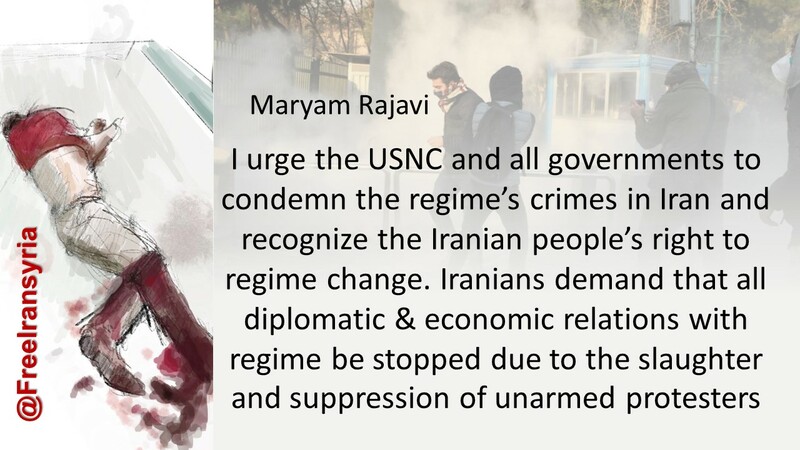 I hail Iran’s young workers and unemployed youths who took to the streets in the courageous uprisings of December and January, and especially those who gave their lives. Hail to the workers who continuously staged strikes and protests throughout last year to demand their rights. The workers of HEPCO and Azarab in Arak, the Steel workers of Khuzistan, the workers of Mahshahr’s Petrochemical Plant, the workers in Gachsaran and Asalouyeh, and the Sugarcane workers of Haft Tappeh. 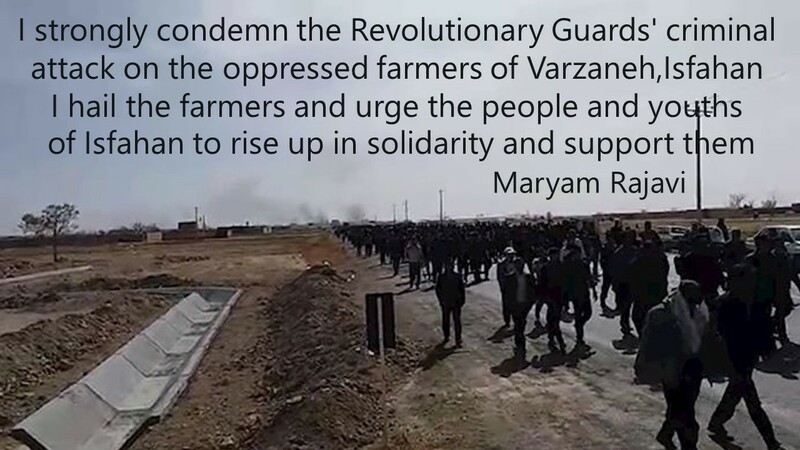 We extend our salutes to the farmers of Isfahan whose protests and demonstrations have been continuing for over two months. 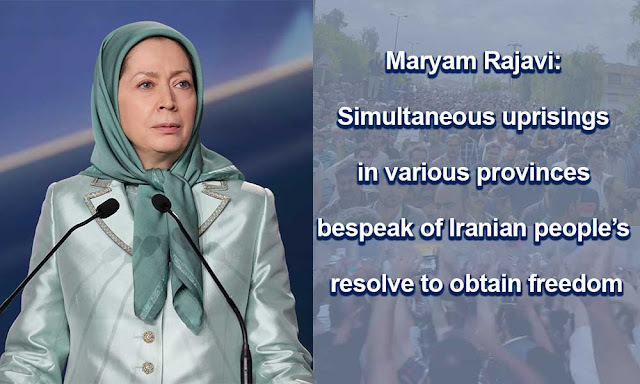 The uprisings in December and January confirmed the validity of a solution that will eventually lead to emancipation of Iranian workers and the oppressed people of Iran and restitution of their rights. 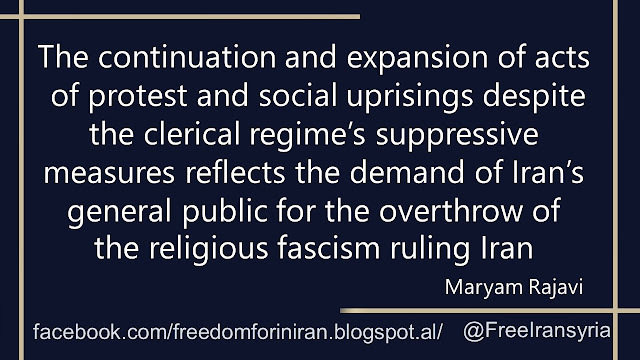 The solution is overthrow of the clerical regime which could be only realized by an organized uprising. This is the prospect heralded by the continuation and expansion of the protest movement. The protests of our Arab compatriots in Khuzistan and the residents of Kazeroon, and the strikes in cities across Kurdistan, Kermanshah, and West Azerbaijan in support of oppressed porters bespeak of our nation’s undeterred resolve for regime change. Toppling the clerical regime is the first step towards emancipation of Iran’s workers. 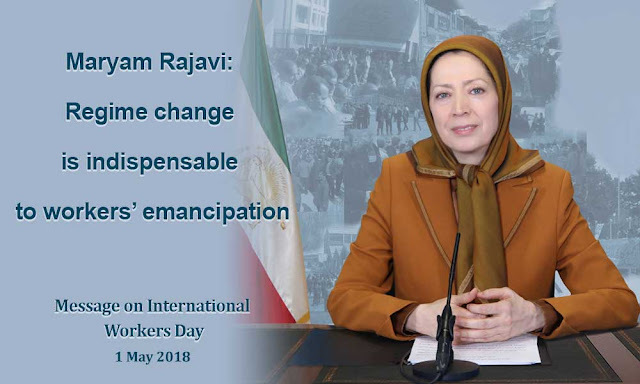 Every single day of the regime’s history since it seized power attests to this truth because the mullahs have eliminated all the rights and freedoms of Iranian workers with utmost cruelty. The Iranian regime has left no windows open for restitution of workers’ basic rights. Today, even timely payment of their wages and salaries has become a far-fetched demand. Their wages are not paid for months and even more than a year. Workers have no way but to loan money and pay monthly interest, sell their kidneys or set themselves on fire. The situation has always been like this for Iranian workers. They have been the first victims of Khomeini’s eight-year war with Iraq and the subsequent governments which took office with mottos of “construction” and “reform.” These were the ones to initiate temporary and so-called “white-signature” contracts for employment of workers. They thus obliterated Iranian workers’ job security. Today, 95 per cent of Iran’s labor force are denied permanent contracts. Hand in hand with their “fundamentalist” rivals, the so-called “moderate” mullahs allowed contractor companies to dominate the country’s job market. The companies belonging to the IRGC and the so-called “reformist” factions have confiscated the lion’s share of workers’ wages. Today, the minimum wage has been set at one-fourth of the absolute poverty line (1). Rouhani’s cabinet has not stopped at this. It has also introduced a plan which allows employers to hire university graduates for only one-third of the minimum wage and without insurance coverage. According to the regime’s officials, this is part of the plans aimed at producing cheap labor force. Such pressures and deprival are much worse for women workers as 70 per cent of workers who sign “white-signature” contracts are women. Young educated women with bachelors and master’s degrees have to work at jobs with monthly salaries of 150 to 300,000 toumans, a mere $46-92. They have to sign blank checks every month, promising not to file any complaints. Indeed, why have the mullahs kept workers in constant want and fear? Why have they criminalized organized labor? Why did they abolish the relatively organized work force of the oil industry despite their brilliant record during the anti-monarchic revolution? Part of the answer is that the mullahs have made Iran’s working class victim of their policy of plunder. Khamenei and the Revolutionary Guard Corps (IRGC) have dominated Iran’s economy and pocketed astronomical profits from worker’s blood and sweat. The regime’s other motive in clamping down on the working class and disintegrating it is to prevent workers from playing their role in the protests for regime change. This is exactly why the realization of workers’ rights and the rights of all of Iran’s people to freedom, democracy and justice directly depends on the overthrow of the clerical regime. The time has come for you to take a long stride forward by expanding your protest movement and concentrate on the main cause of workers’ misery and destitution. Contending to small concessions in the framework of the status-quo will not achieve anything for workers’ struggle. For every small step you take at high cost towards achieving your trade and economic rights, the clerical regime and their accomplice take ten new steps to deprive workers of their rights. Promises made by the regime’s factions and tying hopes to illusive incidents will not relieve workers of poverty and job insecurity. None will improve the dismal life of their families or save child laborers. We cannot sit idle and wait for suitable circumstances to happen on their own. Such circumstances must be created by the struggle and resistance of you, brave workers, for regime change. In order to achieve freedom and emancipation, you have to rely on your own power. You have to get organized. The secret to prevail over the shameless onslaught of the clerical regime and its Guard Corps (IRGC) on your lives and rights is to associate your protests with the nationwide struggle for regime change. So, you must get united with your fellow workers and set up centers of rebellion wherever you are. You must muster all your power to start the uprisings. Today, all workers share common demands. They want revocation of all temporary and white-signature contracts. They want the contractor companies disbanded. They want reasonable pay raise to meet their needs, and they want to enjoy the right to form independent and free unions. Endeavoring to reach these demands is part of the struggle for the overthrow of the clerical regime. Therefore, you should encourage workers of every production unit to rise in protest and stage strikes. You must expand your marches and demonstrations in all provinces. With the assistance of your compatriots, you should create a fund for aiding the striking workers and providing the needs of families of imprisoned workers. You should encourage all your countrymen to support your efforts to secure the release of imprisoned workers and send laid off workers back to work. Workers’ united struggle must be associated with the organized nationwide resistance, centers of rebellion and the army of freedom, and will succeed in solidarity with the protests of farmers and other deprived sectors. Regime change and the overthrow of the worst enemy of Iranian workers, i.e. the clerical regime, is within reach. The blest day of freedom and equality is on the horizon. 1- The minimum wage for the Iranian year 1397 (March 2018 – March 2019) is a little more than one million toumans which is approximately $200 a month. At the same time, Iranian economists have estimated that any family that earns less than 4 million toumans a month, is below the absolute poverty line, meaning that they are not able to provide their most basic needs. 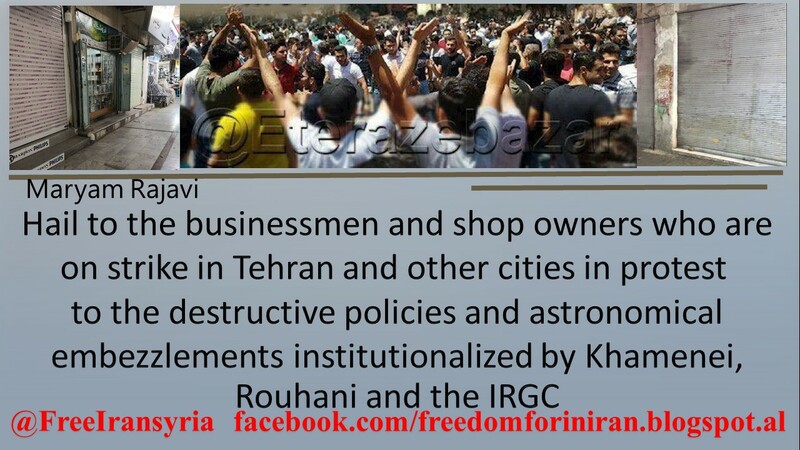 Simultaneous strikes and protests in various cities in the provinces of Kurdistan, Kermanshah, West Azerbaijan and the upheaval for the seventh consecutive day in Kazeroun, as well as the two-month protests of farmers in Isfahan and the rising of our Arab compatriots in Ahvaz and other cities of Khuzistan over the past weeks, once again bespeak of the readiness of Iranian society to expand the protests for the overthrow of the mullahs’ religious tyranny. The arrests and killings, including murdering of prisoners under torture, have not had any impact on the resolve of our people to obtain freedom. 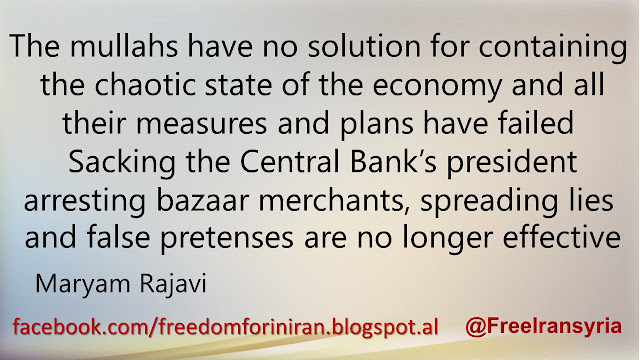 Iranian people no longer wish to see continued poverty, repression and rule of religious fascism. 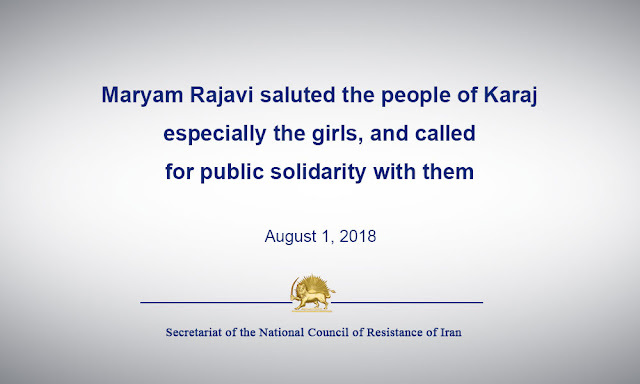 For one week, our nation’s cry for justice is being echoed by the protests of the courageous people of Kazeroun who chant, “We are fighter women and men” and “beware of the day we become armed.” This is reminiscent of the roars of the brave children of Kazeroun who joined the ranks of the Mojahedin to fight for freedom. We commemorate the heroes from this city who were massacred in 1988. Hail to the people of Kazeroun who have a brilliant history of supporting the great leader of Iran’s freedom movement, Dr. Mohammad Mossaddeq, and a large number of whose children have been imprisoned and slain in the struggle against the clerical regime. The cries of the people of Kazeroun who chant, “Our enemy is right here,” reflect the entire nation’s cry. The enemy of Iran and all Iranians are the ruling mullahs who have occupied the country and we must rid our beloved homeland from their clutches. Hail to the people of Kazeroun, Isfahan and Ahvaz who disrupted the mullahs’ Friday prayer masquerades by turning their backs on the podium and calling them “the enemy.” They thus created a scandal for the ruling mullahs. 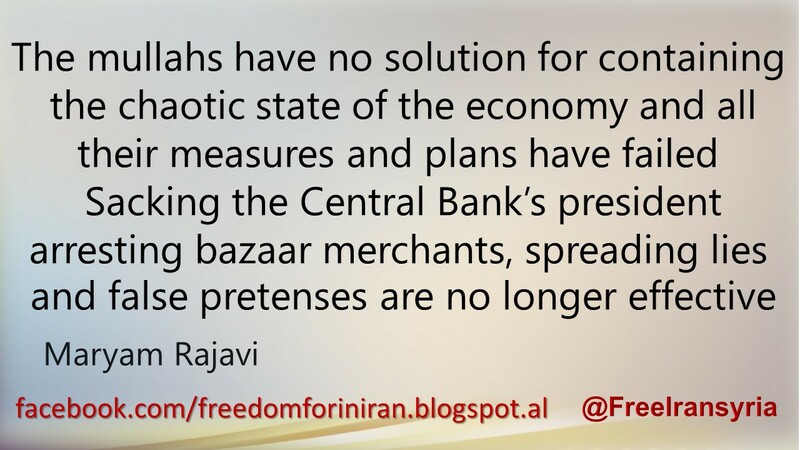 The people of Baneh and Piranshahr closed down their shops and went on strike, spreading their empty table cloths in the streets and the Bazaar. They thus sent a message on behalf of tens of millions of impoverished, underprivileged but raging Iranians who are fed up with their situation. Tens of thousands of young and brave Kurdish youths work as porters to earn a living. How long is this going to continue? They are even deprived of engaging in such a tortuous job in the interest of major swindlers in the regime who work at Khamenei’s headquarters, the IRGC or other government institutes. How much longer must they suffer under back-breaking loads or their bodies be pierced by bullets shot by revolutionary guards? How much longer must a large number of people in western provinces earn their living by carrying such intolerable loads? 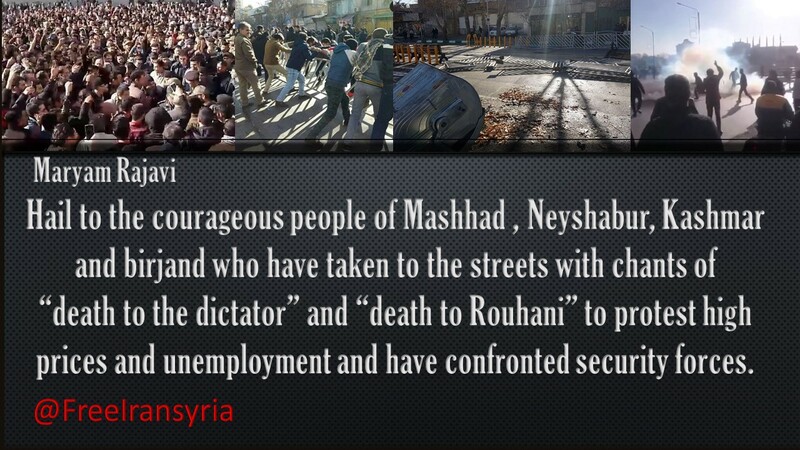 Shame on the mullahs’ regime which has placed such heavy burdens on the shoulders of the deprived people of Kurdistan. So long as the clerical regime is in power, young Kurdish men have to work as porters, farmers have to face water shortages, workers have to be denied their salaries. Our Kurdish, Arab and Baluchi compatriots have to endure discrimination and double oppression, and the entire nation has to suffer from poverty and repression. 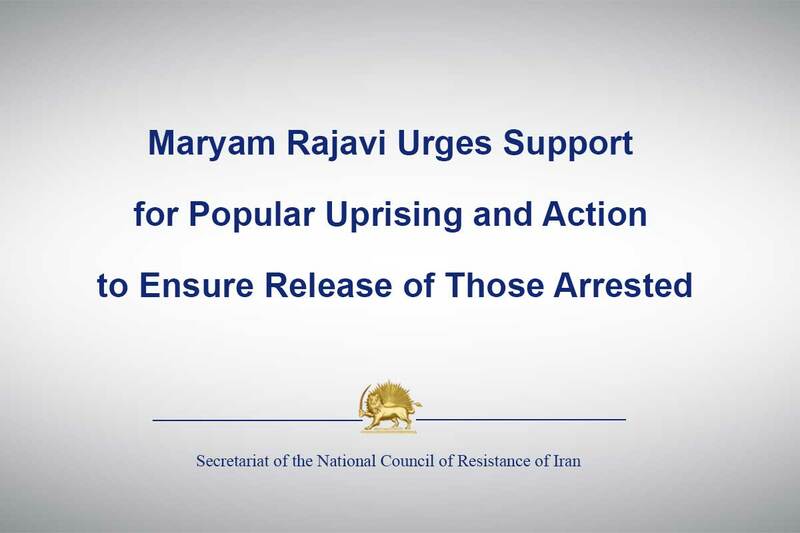 I call on my fellow compatriots to expand the protests, declare solidarity with the arisen people of Iranian provinces, and insist on freedom of those arrested, particularly the hundreds of compatriots arrested in Khuzistan. 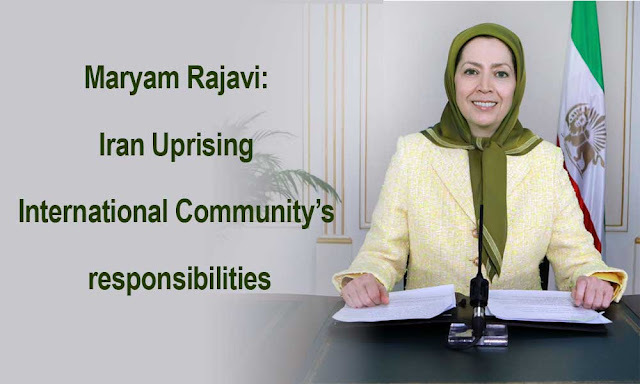 Maryam Rajavi lauded the strikes by the bazaaris and merchants in Baneh, Marivan, Saqqez, Javanrud, Sardasht, and other cities along the western Iranian border, the courageous uprising by the people of Kazerun, the widespread protest by the people of Saman and other cities of Chaharmahal and Bakhtiari province, the demonstrations by the looted residents of Tehran, Ahvaz, Rasht, and other cities, and the protests by families of those arrested during the past weeks’ uprisings in cities in the Province of Khuzestan. She urged the young people to take part and support these protests. 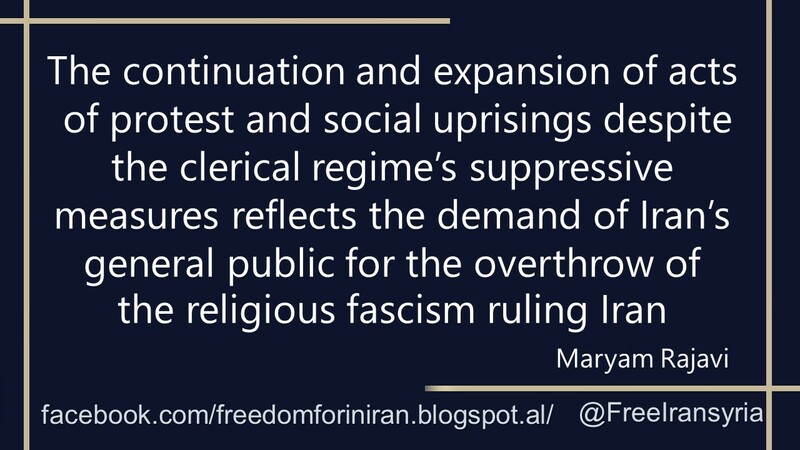 “The continuation and expansion of protest actions and uprisings despite the clerical regime’s suppressive measures, reflects the demand of the overwhelming majority of the Iranian people for the overthrow of the religious fascism ruling Iran. 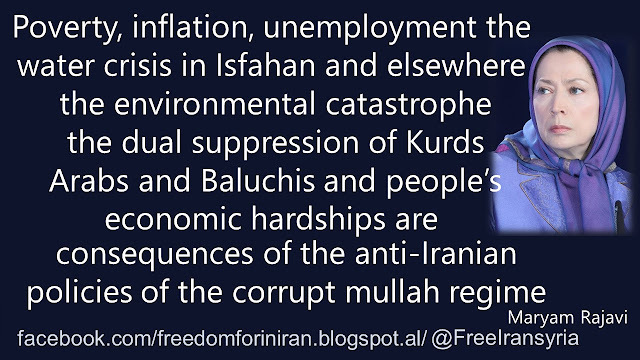 Poverty, inflation, unemployment, the water crisis in Isfahan and other parts of the country, the environmental catastrophe and the deprivation and dual suppression of our Kurdish, Arab and Baluchi compatriots, as well as the painful hardships endured by Iranians to make ends meet, are entirely the result of the policies of anti-Iranian and anti-human, corrupt, and suppressive mullah regime. 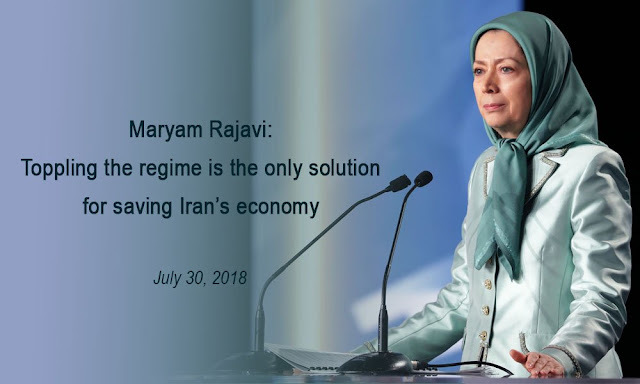 The regime has allocated the entire wealth of the Iranian people to the export of terrorism, warmongering beyond Iran’s borders, domestic suppression, and the nuclear program, or poured it into the coffers of the regime’s leaders and their relatives,” Maryam Rajavi said. Maryam Rajavi: The protest movement has not stopped. Waves of protests follow one another. This is how people rise up and create their genuine feast of freedom. This winter, entwined with protests and uprisings, is now going to give its place to spring in such a way to prepare the future year for movement and uprising and for advancement towards victory and freedom. In reality, the protests did not stop their movement despite widespread arrests and especially the regime’s slaughter of innocent youths under torture. 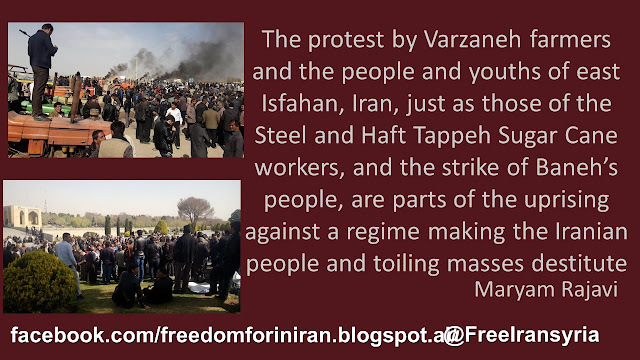 The movement continued to thrive in the general strike of Baneh, the extensive protests of the Steel workers of Isfahan, the protests by workers of Haft Tappeh Sugar Cane Factory in Khuzistan, and the uprising of the farmers in east Isfahan. Waves of protests follow one another. This is how people rise up and create their genuine feast of freedom. The most terrifying things for the regime are four major predicaments: The ubiquitous chants of “death to Khamenei”, eruption of the protests despite maximum suppression, and the absence of external escape goats such as the war with Iraq or the fight against Daesh, and assistance from advocates of the policy of appeasement. This year, in contrast to the previous years, the regime has no way out. 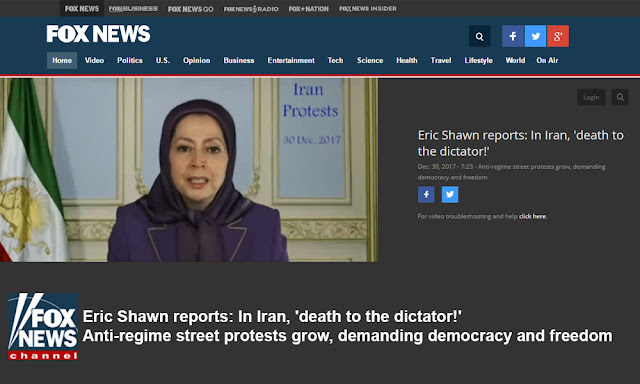 The clerical dictatorship is at an impasse which is the product of years of steadfast perseverance of the people of Iran, their valiant children in the PMOI, and the protesters. This is, of course, very important but what is more inspiring for the people of Iran is the new horizon which has emerged through the uprisings in December and January and is going to answer the question of regime change by 1,000 bastions of rebellion, 1,000 Ashraf's and the Army of Freedom. The time has come for the great house cleaning in our homeland. Iran’s genuine Nowrouz is on its way. 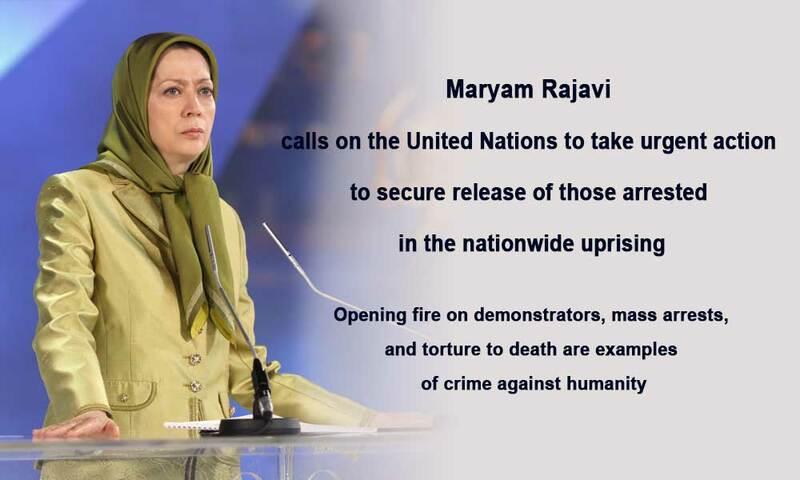 I would like to express my appreciation for your attention to the situation in Iran and the Iranian people’s uprising against the mullahs’ religious fascism. Today, it is universally accepted that the clerical dictatorship is responsible for gross human rights violations in Iran. The regime is also recognized as an immediate threat to global peace and security by continuing the wars in Syria and Yemen, the terrorist operations by the IRGC-backed militias in the region, through money laundering and financing terrorism, with its ballistic missile program in violation of the UN Security Council resolutions, and by taking hostage western citizens. What explains this aggressive behavior? Is it because the regime is powerful, or because it tries to defend itself against foreign threats? None of these answers is correct. 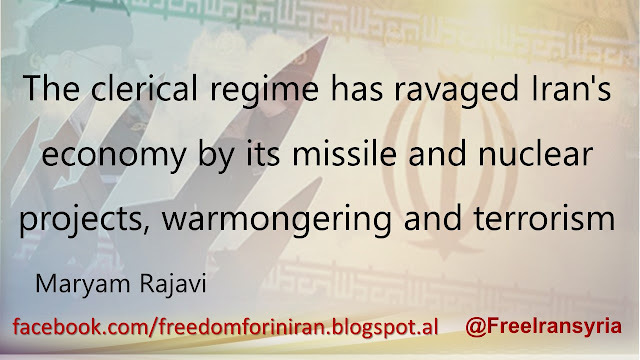 The mullahs’ warmongering must be viewed in the context of its underlying instability at home. The recent uprising in Iran attested to this fact. 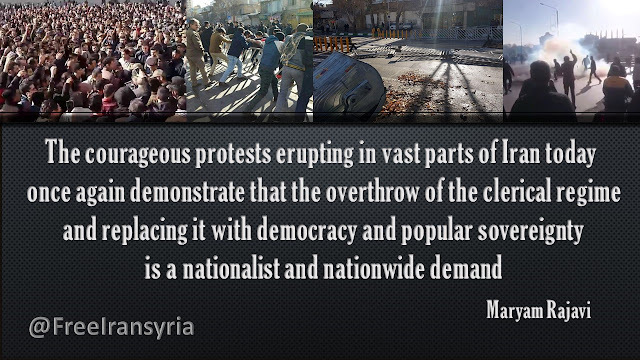 It showed that the mullahs are facing a nation that wants regime change. The uprising showed the rejection of all factions within the regime and the determination of the Iranian people to overthrow the regime in its entirety. And what are the unique features of this uprising? The uprising took place in all Iranian provinces. It focused on the regime’s overthrow. The protesters targeted the centers of suppression. They also rejected the regime’s export of fundamentalism and war to the region. Another feature of the uprising was that it was organized. The centers of rebellion, supporters of the PMOI, had a significant role in the uprising. 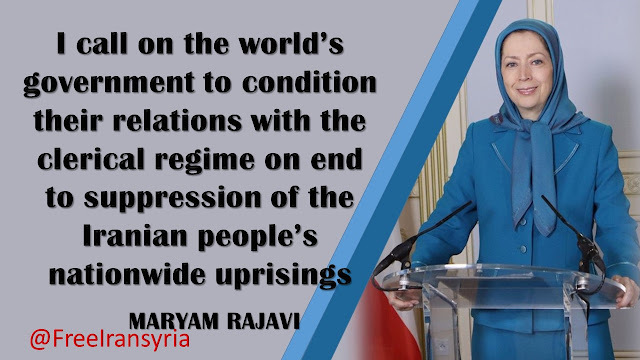 The regime’s president, in his call to the French President on January 2, and the supreme leader on January 9 repeated that the PMOI had organized the uprising. Another important feature of the uprising is its potential to continue. The uprising erupted despite absolute repression. 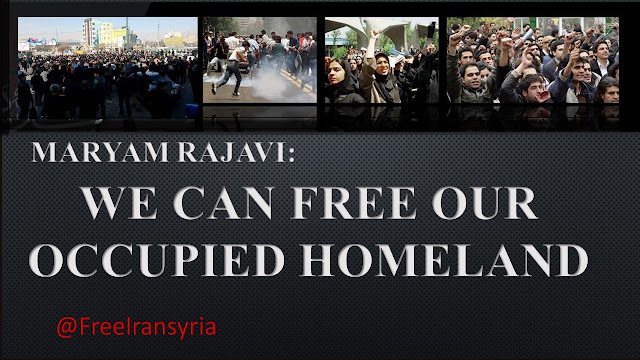 The IRGC arrested 8,000 people. They also murdered dozens of protesters and at least 14 were tortured to death while in detention. Nevertheless, protests are on the rise. In recent weeks, the people of Kurdistan staged a general strike. The farmers of Isfahan staged an uprising. The workers of Steel Industries and Sugar Cane Factory have been on strike and demonstrating in the streets for a long time. 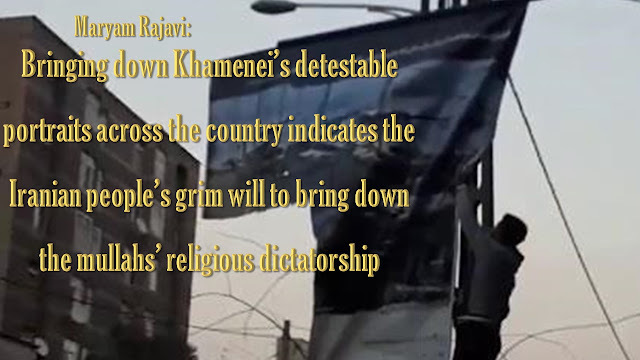 Enraged citizens have staged numerous demonstrations outside government buildings in downtown Tehran. What do the people of Iran and particularly the protesters, expect from the world community? 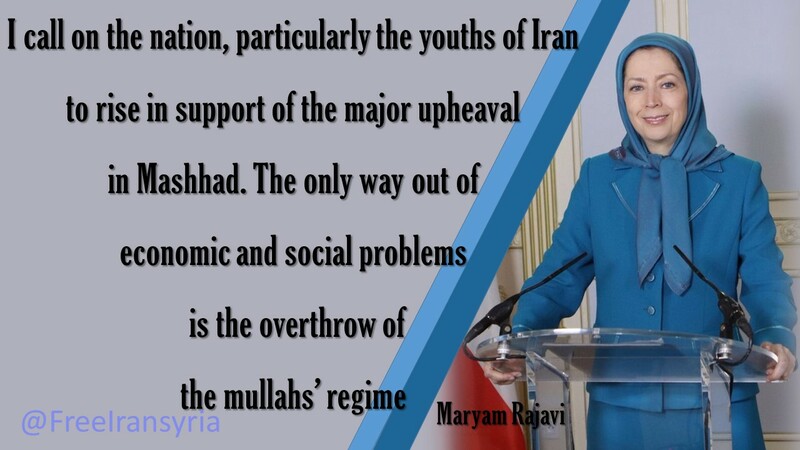 They expect that their struggle for the overthrow of the mullahs is recognized. Regime change, by the people of Iran and the Iranian Resistance is the only answer to the Iranian crisis. All other options have already been tested. The people of Iran expect the world to predicate their relations with the mullahs on end to torture and executions. They also demand the expulsion of the regime from the region, dismantling of its missile program, a total ban on all uranium enrichment and accepting unconditional inspections of its suspected sites. The regime’s access to the international banking system must also be cut off. Let me reiterate, the solution is regime change by the Iranian people and Resistance. 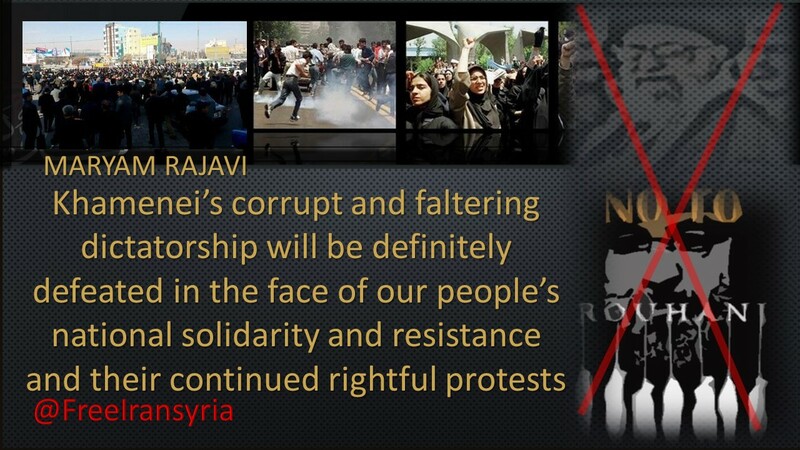 The people of Iran expect the international community to stand by them. I thank you all very much, particularly the honorable US senators who have voiced support for the Iran uprising and for freedom and democracy. A large number of people of Isfahan, central Iran, staged a demonstration in the city center on Saturday morning, March 10, 2018, in protest to the regime’s crackdown on the deprived farmers of east Isfahan, and in solidarity with them. The people of Varzaneh, Ejiyeh, and Ziyar (east of Isfahan) staged extensive protests and demonstrations on Friday, March 9, which continued into the night. Maryam Rajavi saluted the arisen people of Isfahan, particularly the deprived and toiling farmers in eastern Isfahan Province. She said the drying of Zayandeh Rood which has jeopardized the lives and incomes of hundreds of thousands of people in the region, is part of the environmental disaster engulfing the entire country and a consequence of the clerical regime’s policies and conducts over the past four decades. All the country’s assets and resources have either been plundered by the regime’s leaders including Khamenei’s headquarters and the Revolutionary Guard Corps (IRGC) or consumed on domestic suppression, warmongering, terrorism and unpatriotic nuclear projects. Destruction of jungles, drying of lakes, ponds and lagoons, expansion of deserts, dust storms, diversion of rivers, and construction of dams which only profit the IRGC are parts of the irreparable environmental disaster imposed on our country --directly or indirectly-- by the criminal mullahs. So long as the mullahs’ corrupt regime is in power, the destruction and extinction of our country’s natural resources continue as do poverty, unemployment and acute inflation. 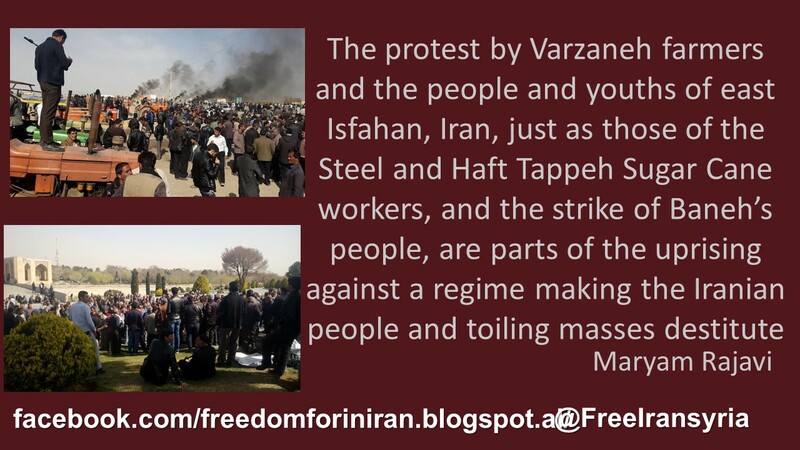 Maryam Rajavi stressed that the uprising of the farmers of Isfahan, just as the protests by Steel workers and the workers of Haft Tappeh Sugar Cane Factory, and the strike of the people of Baneh, are part of the uprising against a regime which has brought about destitution of the Iranian people and toiling masses. 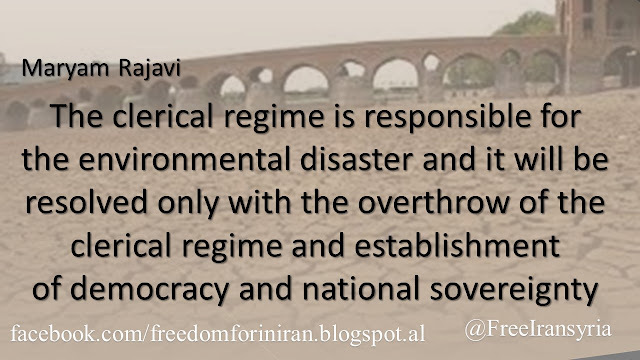 Today, Isfahan farmers’ water share and workers’ past due wages totally depend on the overthrow of the clerical dictatorship and establishment of democracy and national sovereignty. On the anniversary of the demise of Dr. Mohammad Mosaddegh, leader of Iran’s Nationalist Movement, on March 15, 1967, we salute his exalted soul and renew our pledge to continue and advance his path for the happiness of the Iranian nation. Mosaddegh became an acclaimed international icon for taking bold action to nationalize Iran’s Oil Industry on March 20, 1952, an unforgettable landmark in Iran’s history. By leading this struggle, Mosaddegh became a great teacher of patriotism and an unwavering struggle for independence for Iranian people and nations of the Middle East. Khomeini and his heirs thus established a dreadful dictatorship instead of democracy and freedom which the people of Iran aspired for. They also squandered the country’s oil and put it on sale. Khomeini and his heirs resent Mosaddegh not only for his brilliant victory in nationalizing the oil, but for the valuable steps he took to put an end to despotism, corruption and poverty and bring democracy to the various realms of life in Iran. He threaded a road which was totally different from those of the Shah and Khomeini. The pleasant memory of Mosaddegh’s brief tenure has remained in the nation’s mind since he promoted a nationalist and democratic program which was very progressive in his time. The popular uprising on July 21, 1952, helped him pass his nine-point plan in the parliament. The plan enabled Mosaddegh to balance Iran’s foreign trade-- an unprecedented phenomenon in Iran’s history-- despite cessation of oil revenues, through imposing severe control on imports and reducing public expenses. He also managed to balance the country’s domestic budget. For the first and last time in Iran’s history, Mosaddegh succeeded to relieve the country’s reliance on oil revenues for income. His administration introduced a range of progressive social, financial, administrative and political reforms despite tough opposition. He initiated extensive reforms in the Army, in health and education, in the judiciary and legal proceedings, and annulled the special and extraordinary courts. Mosaddegh introduced reforms based on which landowners had to turn over 10 per cent of their revenues to their tenants. According to the new land reforms, the lands owned by the government were divided into small pieces and sold to the public to build their own housing, as a result of which house rent was lowered for low income families. Mosaddegh was in office for only 28 months but his brief tenure was a unique example of a government that defended its people’s rights and national interests, was devoid of corruption and tyranny, and was especially characterized by an unwavering struggle for national freedom and independence. The Shah’s path characterized by authoritarianism and dependence on foreign powers failed. The path of religious tyranny also failed. Inspired by Mosaddegh and the Mojahedin (PMOI), Iran’s young generations have risen up today in dozens of cities across the country. They have a big question: Why doesn’t Iran have a democratic government despite its rich and progressive culture and despite abundant material and human resources? 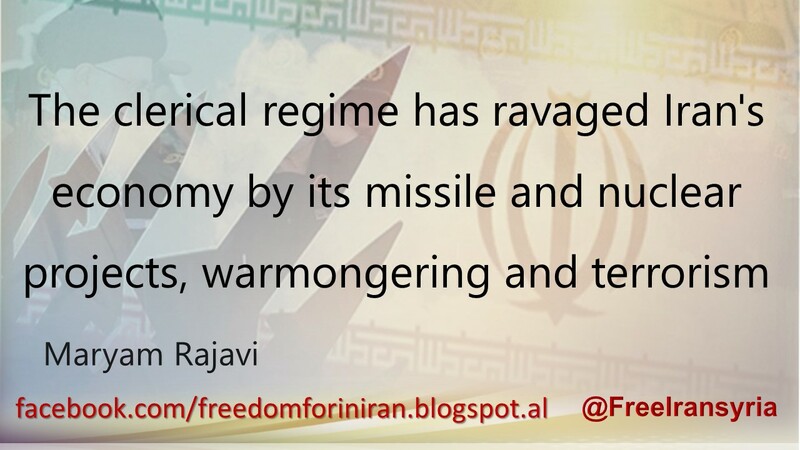 This is the fundamental question that has made Iran’s people restless in achieving freedom, democracy and equality. We also pledge to continue the fight for the overthrow of the clerical dictatorship and not relent until the aspirations of our nation for a free, prosperous land free from all forms of discrimination are realized. Let me congratulate you and all my sisters in the UK on the International Women’s Day. I would also like to appreciate the great women of Britain who have defended the rights of the oppressed people of Iran, and particularly the Iranian women. The women of Iran are encouraged by your support and friendship. 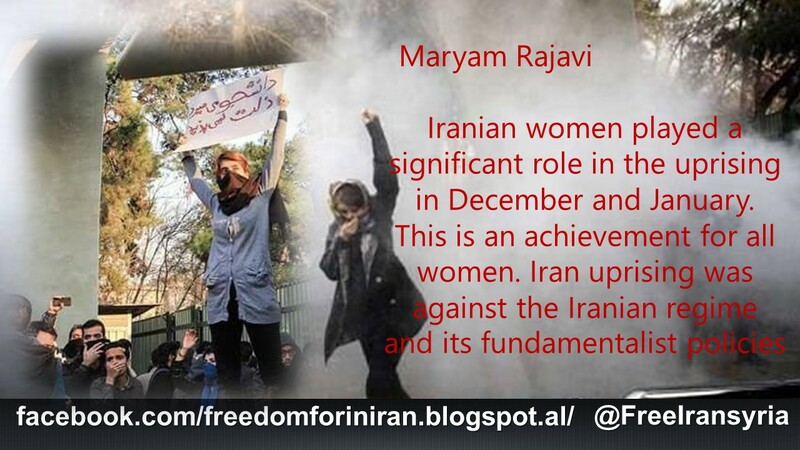 Iranian women played a significant role in the uprising in December and January. This is an achievement for all women. 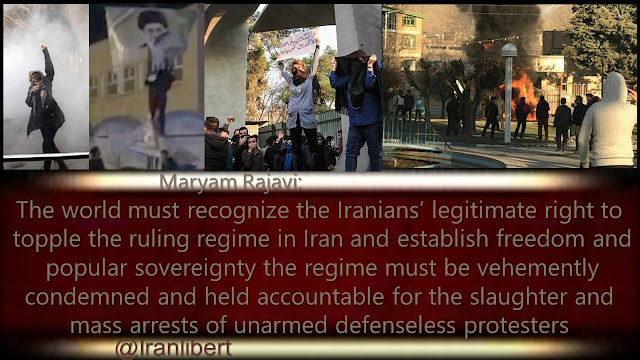 Iran uprising was against the Iranian regime and its fundamentalist policies. The protesters condemned the war waged by the Revolutionary Guards against the people of Syria. They said that time is up for the sham reform. They called for the overthrow of the entire regime. The central role played by women and young people was one of the most important aspects of this uprising. IRGC commanders have confessed that women inspired the protests. The Interior Ministry has also announced that 90 percent of those arrested are under 25. Millions of women and youths in Iranian society are educated, but they do not have any role in the country’s economy and policy. Iran’s economy is collapsing because the mullahs are spending the lion’s share of the country’s revenues on suppression, export of terrorism and war in Syria and other countries in the region. They are also plundering a large portion of the revenues. But women and youths are victims of this crisis. 100,000 working women have been fired from their jobs, every year. Some of them are so poor that they have to sell their kidneys. At the same time, women and young people are brutally oppressed. 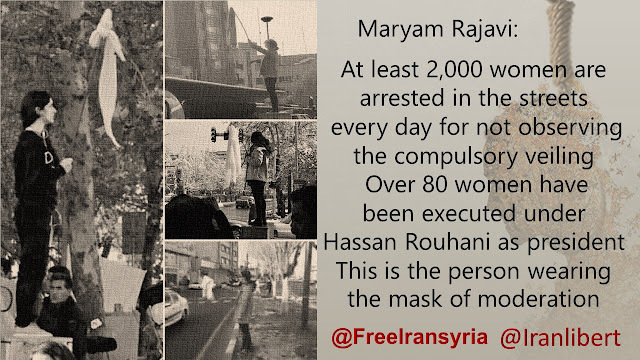 According to the Iranian regime’s officials, at least 2,000 women are arrested in the streets every day for not observing the compulsory veiling. Over 80 women have been executed under Hassan Rouhani as president. This is the person wearing the mask of moderation. 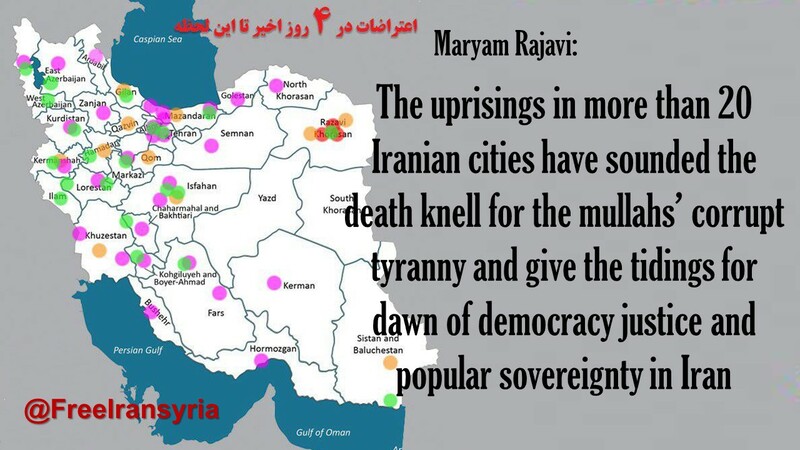 Despite all this, Iranian women and youths have been able to expand the uprising to 142 cities. They have a fundamental role in expanding the protests and strikes. They are preparing for future protests. The situation in Iran is turning against the mullahs. Iran’s women and youths seek the overthrow of the religious dictatorship. They want a republic based on separation of religion and state. They seek establishment of freedom and democracy and women’s equality. I would like to urge members of the British houses of Parliament to support these demands. The people of Iran expect the British houses of Parliament to take necessary actions to stop all commercial relations with IRGC firms. 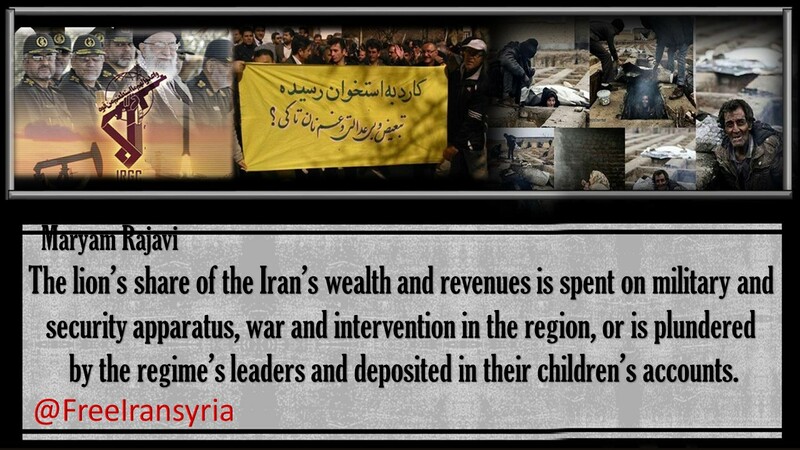 Every single penny added to the mullahs’ revenues contributes to suppression and poverty in Iran, and fuels the war in Syria and other countries of the region. The mullahs have killed at least 12 protesters under torture. They have arrested thousands of protesters. I urge you to help stop this brutal suppression. Encourage the UK government to condition its relations with the regime in Tehran on ending torture and executions. The uprising of your sisters in Iran against the mullahs’ misogynist regime is an advancement for all humanity. Any step you take for them, any activity in defense of the arrested women, any effort to expose the torture of prisoners, and anything you do to compel your governments to cut ties with the clerical regime, is going to have an impact. In the present circumstances, we call for the immediate release of the prisoners of the uprising, freedom of expression and assembly, and abolition of women’s suppression and the compulsory veil. To realize these objectives, we need the support of each and every one of you. The day when the women of Iran destroy the roots of fundamentalism in Iran, freedom and equality will make a leap forward all across the world. And that day is not far. 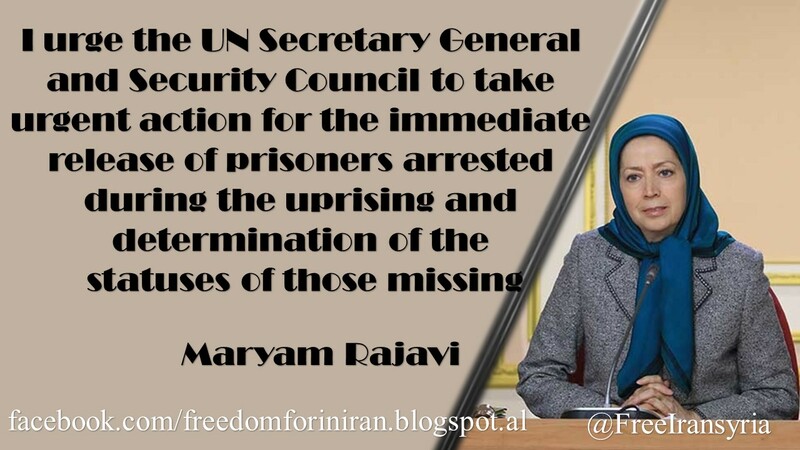 Mrs. Maryam Rajavi, President-elect of the National Council of Resistance of Iran, called on the UN Secretary General, Security Council, member states and High Commissioner on Human Rights as well as other relevant international organizations to take urgent actions to have those arrested during the Iranian people’s nationwide uprising immediately released and determine the statuses of the disappeared. Opening fire on demonstrators, mass arrests, and torturing prisoners to death – as practiced these days by the clerical regime’s henchmen in various Iranian cities – are indisputable examples of crime against humanity and demand urgent action by the international community. 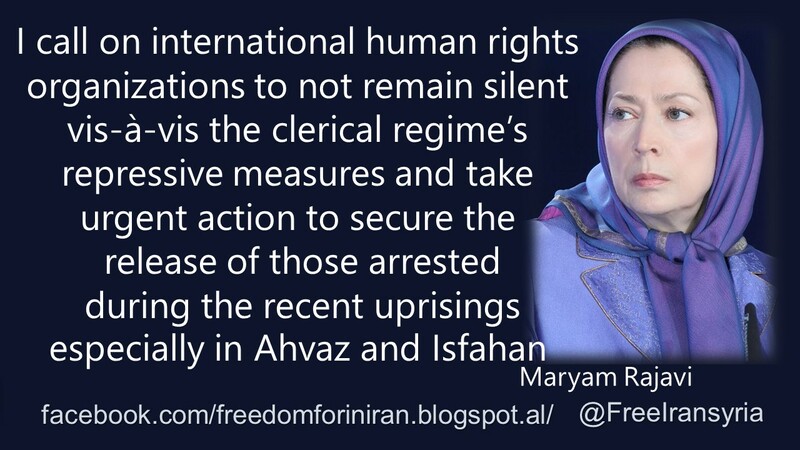 Maintaining silence over these crimes emboldens the religious fascism ruling Iran in continuing its crimes. 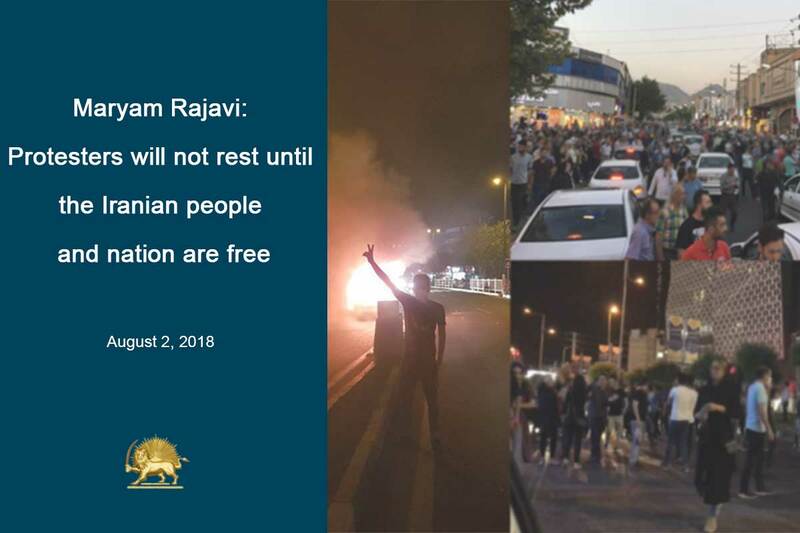 In the first two weeks of the nationwide uprising of the people of Iran, at least 8000 protesters were arrested by the Revolutionary Guards (IRGC) and suppressive forces. A large number of them have disappeared and there is no news available on them. 90 per cent of those arrested are under 25 years of age and 35 per cent of them are high school students. 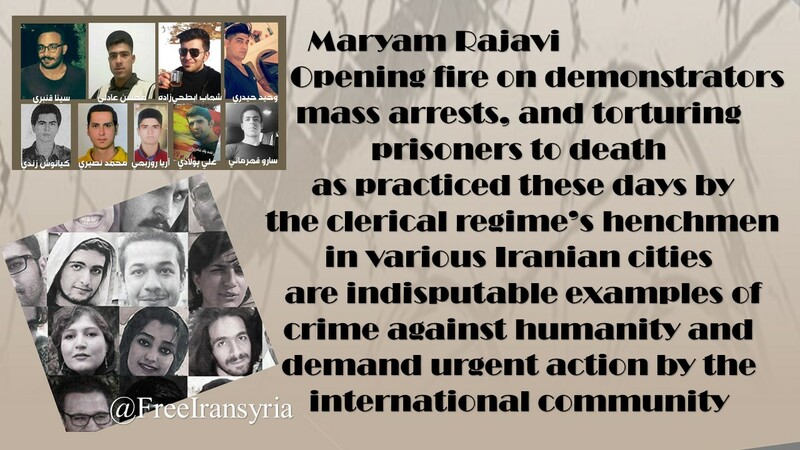 A number of these prisoners have been killed under torture in Tehran and other cities including Arak, Sanandaj and Zanjan. 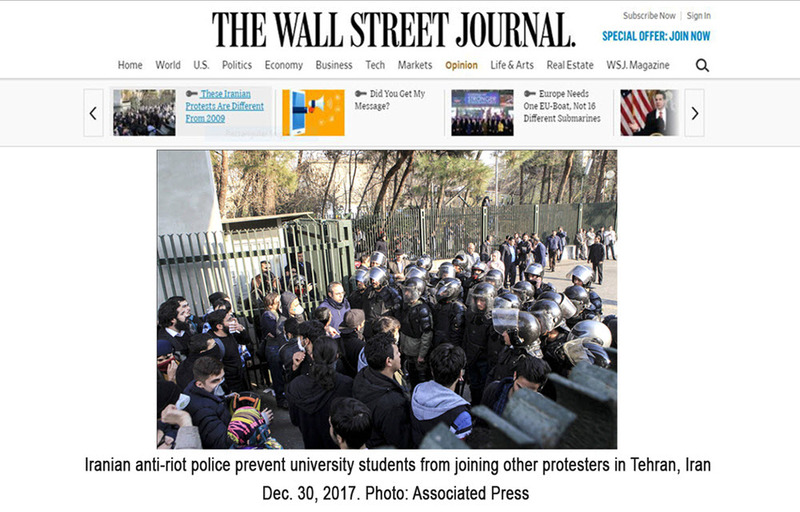 The president-elect of the Iranian Resistance has written a powerful piece for the Wall Street Journal explaining why the current wave of protests in Iran are completely different from the 2009 protests about the rigged re-election of Mahmoud Ahmadinejad. The current protests, which began over a sharp increase in the cost of living in late December, have turned into widespread demonstrations for the end of the corrupt clerical regime and spread far further than the 2009 protests ever did and show the international community that the Regime is on borrowed time. Millions of Iranians live in poverty but the Regime is doing nothing to help. Instead, they are spending $100 billion to prop up the Syrian Regime and support terrorist groups like Hezbollah and Hamas instead. The regime’s latest budget allocates over $26.8 billion to military and security affairs and the export of terrorism in addition to the $27.5 billion in military spending from institutions controlled by Khamenei and the Islamic Revolutionary Guard Corps (IRGC). By comparison, the healthcare budget is just $16.3 billion. The Iranian protesters have been chanting “Death to Hezbollah” and “Leave Syria, think about us instead”, proving that they oppose the Regime’s deadly destruction of the Middle East, especially at the expense of their own people. It is also worth noting that the Regime’s corruption is widespread and well known. That is why there are no illusions of internal reform from the protesters; simply, the Regime must go. Not only are the current protests much wider spread geographically, they are also much wider spread in terms of demographics. Rather than being made up of mainly middle and upper-class Iranians, these ones are made up of people from every class, ethnicity, religion, and gender. 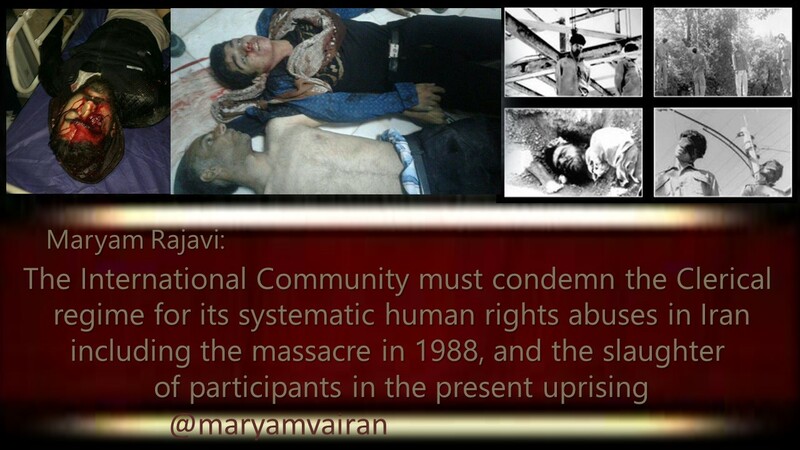 4.To sanction the clerical regime for its systematic human rights abuses in Iran, including the massacre in 1988, and the slaughter of participants in the present uprising. The ongoing uprising in my enchained homeland is a quest for freedom, democracy and equality. It is a movement for social justice; and it is a movement which will carry on until final victory. If you persist, the world will stand with you and on your side. 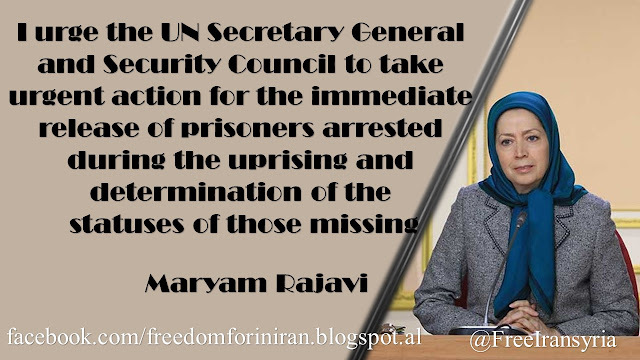 Ending the silence on Iran and shattering a 4-decade-old barrier of appeasement of the regime, the UN Security Council’s meeting on Iran is a product of the Iranian people’s uprising, the sacrifice of its martyrs and the suffering of its captives. The world’s major governments had so far turned a blind eye on brutal suppression of our people and executions of 120,000. Iran’s protesters and youths, however, have in their first step turned the page of the United Nations and Security Council’s history on Iran. 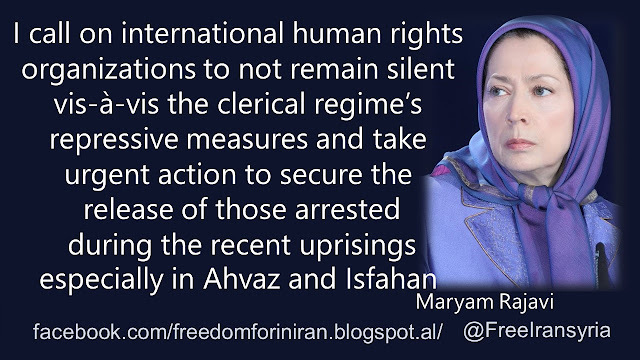 This indicates that the young men and women who rose up in the streets of Izeh, Doroud, Tuyserkan, Ghahdarijan, Jouyabad of Isfahan, and 75 other cities can and must turn the darkest page of Iran’s history. Thousands of salutes to those martyred in Doroud, Tuyserkan, Noorabad, Izeh, Shahinshahr, Ghahdarijan, Homayounshahr and Jouyabad of Isfahan! Courageous sons and daughters of Iran! You have brightened up Iran’s cities with the light of struggle for freedom and justice. Well done! You have shaken the ground under the feet of the mullahs’ rotted regime. You have brought the nation closer to her dreams of 100 years. 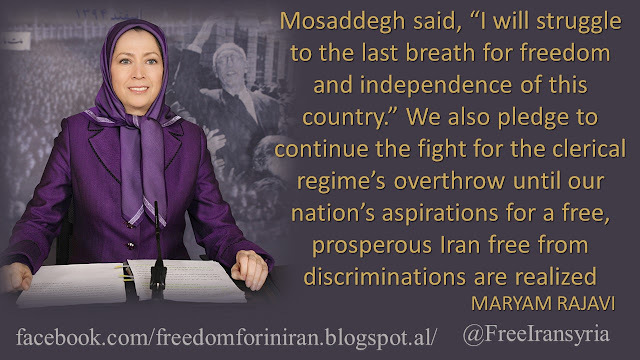 You have proven that it is possible to liberate Iran from the yoke of religious dictatorship and theocracy. The nations of the Middle East, from Syria to Iraq and Afghanistan, those who have suffered tremendously because of the mullahs’ oppression and their theocratic regime, are praying for your victory. The world’s freedom lovers have vested their hopes in you, and the world has heard your voice. Governments and international organizations have come out one after the other to support and praise you. The nation’s martyrs, including the heroes and heroines of the 80s, the political prisoners massacred in 1988, the martyrs of 2009 and the martyrs of Ashraf, have set their sights on you. You are the children of Sattar Khan , Dr. Mohammad Mossadeq, and Mohammad Hanifnejad . And your uprising will revive all of Iran’s honors. Today, Khamenei and his cohorts take resort in threatening you. They trumpet their criminal record. They mobilize their military forces to counter the Iranian people’s nationwide uprising. Their so-called reformist and moderate proxies who have stopped at nothing to provide services to the mullahs’ religious fascism, have now removed their masks and called for suppression of freedom-loving people. They grab at any straw to prevent throngs of people from joining your ranks. Behind such threats, however, the regime is twisting and turning out of enormous fear. Despite its hollow show of force, the clerical regime is just a paper tiger and will not withstand your uprising. Because you are the decisive power. You are countless and your numbers grow every day. When you get sincerely united and join hands, your solid resolve will overcome any power. The mullahs think they can contain your upheaval and stop its expansion by blocking the internet services and social media. But they do not know and cannot understand that it is your common pain and suffering that bonds your hearts and spreads the message everywhere. And this is how the cities rise up one after the other. I call on all my fellow compatriots to rise up and join the roaring tide of freedom lovers across the country. This uprising is yours and it is for you. Your children have risen up and engaged in a decisive battle to turn the darkest page of Iran’s history. Rise to their aid! Do not abandon the protesters, and the army of deprived and plundered people. Do not leave them alone in the streets. Now is the time for workers, farmers, Bazaar merchants, government employees, teachers, physicians, nurses, university professors, and all social sectors to support them. 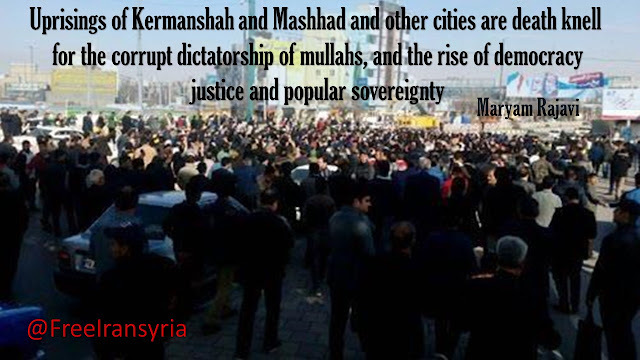 This is an uprising that belongs to the freedom-loving but enchained people of Iran. Do not lose any opportunity to support and join the courageous women and men who fight on the streets and risk the dangers. Stage sit-ins and strikes anywhere you can, in the factories and offices and at every work place, so that the world will see the general public's protest against the mullahs' detested rule in Iran and hear our nation's voice. His messages, these days, are the best and clearest practical guidelines. And this is a movement that will carry on until final victory. The Senior IRGC commander further added: “regarding the presence of the members and affiliates of the People’s Mojahedin Organization of Iran in these riots, it is notable that when Maryam Rajavi officially sends a message and calls everyone to take into scene, it is evident that they (PMOI/MEK) members and supporters are in the front row. Estimates say that up to one million Iranians have been protesting across the country since Thursday in what one Iranian opposition group says has turned into a protest for regime change.